The winter can be disappointing for paintballers, especially in the northernmost states in the U.S. where temperatures can hit single digits. Sure, some die hard paintballers are not held back by a little powder. But the fact is most players play less during winter, or stop altogether.Winter doesn’t have to go to waste. Paintball players can make use of the extra time to polish their skills, fine-tune their game to get an edge on the competition, or even sit back and prepare financially for the upcoming season. You don’t have to be “active” in paintball to be active in paintball. Here is a list of things you can do during the off season, some of which you can do without spending any money. Practice drills can substantially improve your performance on the field. Practice your dives. Learn new moves. Get some friends and run through movement patterns. If you don’t know what drills to practice, just look online. While I have yet to add drills to the mix of articles available, you can still find some great off-beat paintball tactics in the Tactics section of this website. We have all had the experience of being out of breath after an intense paint ball game. Cardio workouts improve players’ speed, agility on the field, and endurance during long or intense matches. Similarly, strength training can improve paintball player’s endurance when crouching behind a bunker, crawling low to the ground, or launching into action. Everyone wants a buff upper body, but paintball players benefit most by improving their legs’ strength and middle torso area. Your paintball gun takes a beating during the year. Many paintball players neglect to give their market a good cleaning during prime paintball season. When winter comes, it’s a good time to give the paintball gun a good cleaning, oil it if necessary, and replace any parts that are not working properly. Stock up on paintballs and ensure you have the equipment you need for the upcoming year. It’s a good time to consider whether an upgrade to any equipment would improve your game, and which upgrade would give you the best edge. eBay is a great place to find cheap paintball supplies, just make a list of want you need and plan to look for the perfect deals for a couple of weeks. If you are planning on purchasing a paintball gun be sure to do your research and take note of the 4 make-or-break features of paintball guns. New paintball groups and tournaments are being started all the time. Ask around at paintball shops or fields in your area to find out what events will be starting in the spring. If you are feeling bold, consider organizing a paintball event yourself. For example, find a location for a scenario game or plan a mini speedball tournament. Invite your friends and take a flyer to the local paintball fields and shops so people can find out about it (include an email, phone number, and website for more info). To share the load, consider inviting a couple friends to be co-organizers with you. Planning a local event allows you to set the rules and provides a fun experience for your friends. Sure, it’s cold in the winter. but snow and cold can create an entirely new paintball experience. Deep snow can slow the game down, which provides a fun change of pace. The cold means you sweat less and can wear thick clothes, which means no paintball welts. One challenge of winter paintball is fog on your mask. However, a fog spray can easily solve this problem. Contrary to some newbish beliefs, freezing paintballs is one thing you will not have to worry about. Of course, one of your choices is to not play at all and spend all of your free time saving up money for spring. If you are a paintball team this may be especially important. You can always play once or twice to keep your skills on par. If you don’t want to work for the man, and paintball is your passion, then consider making money for paintball through paintball. You can do this by buying equipment from local players for cheap and reselling it on eBay. Careful, it’s highly addictive and before you know it you have an entire collection up for sale online like a up-and-coming paintball arms dealer. Unless your in an area that has a plethora of tournaments in the off season, you may want to consider taking the extra time gained to pick up some sponsors. The off season is perfect for this, as its not just a break for many paintball teams, but it also is a time where many sponsoring paintball companies are looking and re-evaluating sponsorship opportunities. Stay on top of paintball by keeping up with the latest player, industry, gear, and community news. If you just got into paintball then the off season is the perfect time for you to dig deep into paintball terminology and educate yourself. You can find definitions for paintball slang and terminology in many online forums, or you could just google it. Hit up gear specific forums for your paintball gun to learn more about its operation or the latest mods you can do to it, or download a paintball podcast to hear the latest news. As you can see, winter offers plenty of opportunities for paintball players. 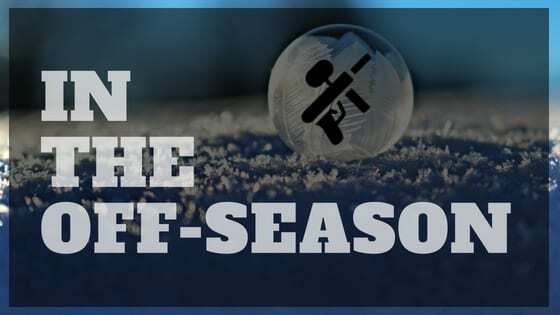 You can have fun in the winter and improve your paintball skills before spring. By spring, you will impress your friends and competition bringing a whole new level of play to your game.